The summers get too hot having a dehydrating effect on the body. Some of the summer fruits you eat make a great treat for your dogs too. These summer fruits are packed with a healthy dose of required nutrients and antioxidants which are good for you as well as your pets. Watermelons: Just get rid of as many seeds as possible and this sweet fruit keeps you and your pet hydrated thanks to its water content. It prevents heat strokes and contains vitamins like A, B6 and C which are good for their fur and teeth. 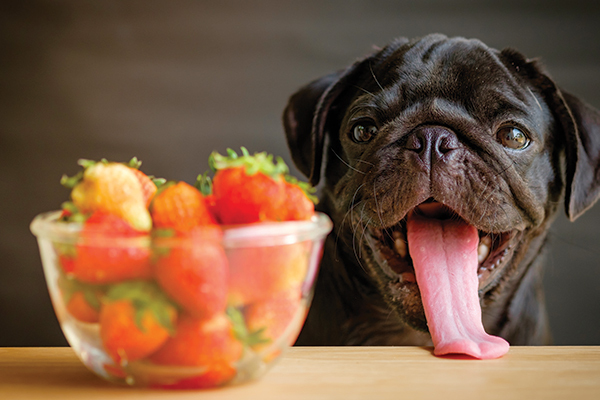 Strawberries: A handful of strawberries make a good dog treat. You can give them fresh strawberries or slice them up, freeze and serve them like popsicles. Cantaloupe: Just scoop up the melon and serve it without any salt. This fruit loaded with beta carotene that is very good for eye sight and beneficial for conditions like glaucoma and cataracts. Apart from treating eye conditions, it is also a good source of vitamin A.
Apples: A sweet fruit that’s high on fibre, apples are a good addition to your dog’s diet. Take off all the seeds, slice up and serve with peanut butter if you want or just raw fruits cut up will work as well. Oranges: Don’t go overboard with the quantity as too many oranges can cause a stomach upset because of the citric acid. Occasionally feeding you dog orange slices works well. Bananas: Another fruit that is great for dogs, an inch of banana sliced up will be perfect. You can serve these fruits raw or slice them, freeze and serve like popsicles to help them beat the summer heat and snack on something hydrating, tasty and healthy.